Pa Ranjith’s second film is a gritty and realistic drama that starts well but gets a little lost in the second half when the focus of the story moves more towards a fairly awful romance. However, thankfully the character interactions and underlying political story have enough momentum to bring the story back into focus well before the end. 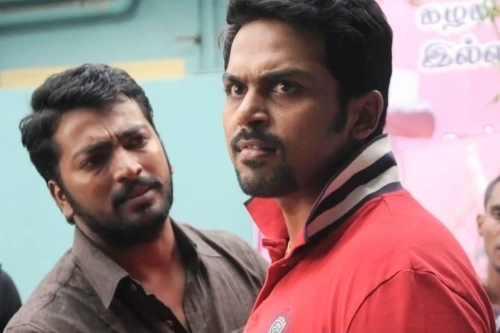 Although Karthi is good in his role as a short-tempered, football loving bloke from a housing project, it’s Kalaiarasan Harikrishnan as his best friend who impresses the most from the generally excellent cast. The notable exception is Catherine Tresa who seems painfully miscast as Karthi’s love interest, and she appears awkward and uncomfortable for most of the film. 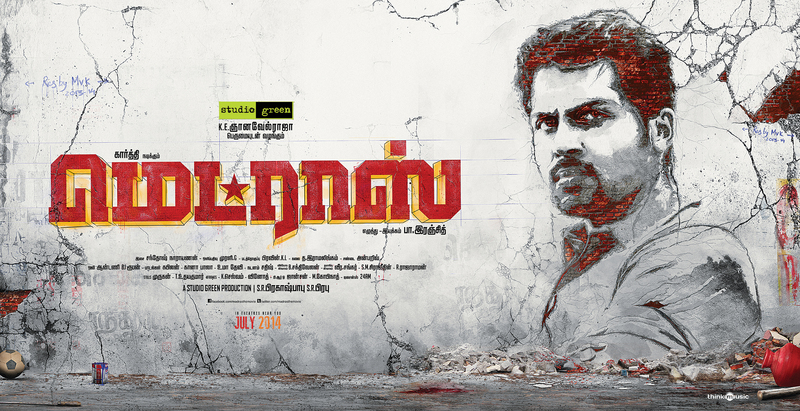 Madras does drag a little in the second half as a result, but overall the portrayal of life in a housing project in Northern Chennai is convincing, while the political shenanigans add enough complexity and interest to make the film well worth a watch. The story follows the rivalry and competition between two local political parties in Royapuram, a district in northern Chennai. While the politicians have managed to split most of the area amicably between the two factions, there is one wall in the middle of the district which remains in bitter contention. After some initial wrangling, for most of the film the wall features a painting of the deceased leader of one party (Jayabalan), but while his son Kannan (Nandakumar) and followers are determined to keep this image on the wall, Maari (Vinod) and his party want to claim the wall for their own propaganda. Caught in the middle are the people who actually live in the shadow of the wall and for whom the two political leaders talk the talk but don’t actually deliver very much in the way of benefits. This is simply highlighted in the way the women meet every morning to get water from a pump, and in the various fractious meetings between the rival young men of the area and party leader Maari. Anbu (Kalaiarasan Harikrishnan) is the up and coming political activist in Maari’s party, and one of the driving forces behind the campaign to retake the wall. His relationship with his wife Mary (Ritwika) is one of the best I’ve seen onscreen in Tamil cinema and their stolen moments of intimacy have just the right amount of tenderness and humour. Both Kalaiarasan and Ritwika are brilliant in their roles here and I just wish the film had focused more on them and their relationship. Excellent performances from both made it very easy to completely believe in their characters, along with some very good writing and character development. The couple lives in a small apartment with their young son, and despite Anbu’s political drive and aggression, he is still a man who obviously loves his family and wants to do his best for both them and his local area. His best friend is Kaali (Karthi), an IT worker with a very short fuse to his temper, which spills over into violence with little provocation. While Anbu tries to negotiate his way to solutions, Kaali frequently disrupts his careful dialogues, and seems to think of little beyond the moment. Kaali is however a staunch and stalwart friend, so it seems natural that Anbu doesn’t give up on their friendship but rather tries to mitigate Kaali’s outspokenness and intervene when he flashes into violence. The relationship between the two is complex and Ranjith is to be commended on writing such a convincing portrayal of two angry young men with such different agendas but who still have plenty of common ground. Kaali is also looking out for a wife and believes he has found his ideal in Kalaiarasi (Catherine Tresa), the arrogant and opinionated daughter of yet another local politician. I found Catherine Tresa annoying and wooden in Iddarammayilatho and she does nothing here to change my opinion. The character of Kalaiarasi is interesting and has potential, but I’m not convinced by Tresa’s portrayal here at all. She appears to be obviously ‘acting’ all the time and never manages to develop any rapport with her co-actors. Perhaps her inclusion was Ranjith’s attempt to make his film more commercially appealing, but her performance definitely doesn’t work for me, and neither does the romance. The rest of the story does however work well and despite the fairly obvious plot the first-rate characterisations are enough to keep it believable and interesting. The various other support actors are effective with Rama as Kaali’s mother having some of the funniest dialogue, while Hari as local eccentric Johnny is cleverly used to further the storyline. Anbu and Kaali’s friends are also convincing in their roles while the various enforcers used by the two political parties are much more realistic (and therefore believable) than the rent-a-thug gangsters usually used in such roles. The cinematography by G. Murali is also excellent, with the chase sequences through the narrow streets a major highlight, but everything is perfectly framed to ensure the wall looms over everything and everyone in the area. Although there are a few songs they are used sparingly without long disruptive dance sequences, while the film does include some excellent dancing with the addition of a local area dance troupe who cycle through some of the important scenes and indulge in spontaneous dancing whenever possible. I approve! The escalation of such a small issue as the slogan on a wall into an all-encompassing problem, along with the back-stabbing, petty rivalries and jealousies is well handled and makes Madras a more complex tale than it first seems. It’s the very ordinariness of the characters that ensures the film feels very realistic, while keeping obvious heroics out of the equation gives the film greater impact. Essentially Pa Ranjith has taken an old story and dressed it up into something new, with clever characterisations and good use of locations ending up with a film that’s a cut above the usual political thriller. Madras is definitely well worth a watch for impressive performances and a relatively realistic look at one of my favourite cities. This entry was posted in Kollywood and tagged Catherine Tresa, G. Murali, Hari, Jayabalan, Kalaiarasan Harikrishnan, Karthi, Karthik Sivakumar, Madras, Nandakumar, Pa Ranjith, Rama, Ritwika, Santhosh Narayanan, Tamil, V. I. S. Jayabalan, Vinod. Bookmark the permalink.